The elegant simplicity of mission style furniture is highlighted with small details that enhance its appeal in our Amish West Lake Mission Bench. 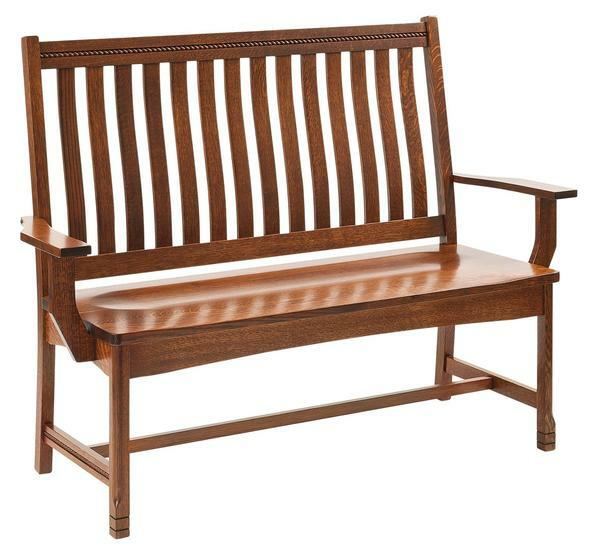 Delicate beading lines the top rail of this solid wood bench, while the gently waved slats ensure a comfortable seat. Beautiful in your foyer, hallway or as additional dining room seating, this handcrafted bench is the finest mission furniture for your home collection. The West Lake is shown here in quarter sawn white oak wood with Michael's cherry stain. Quarter sawn white oak wood is a popular choice for mission furniture, lending strength and an attractive texture to the wood.